If ever there was a card I proud of but died a little making ... it was this one. Growing up I loved the Detroit Bad Boys. That's my team. I'd make a case for me being their biggest fan. I can remember as a kid being so anxious watching playoff games that you'd think I was playing. The Chicago Bulls in general, and Michael Jordan specifically, were the enemy. They didn't like us and we didn't like them. I'm old school. I respect them (barely), but I STILL do not like them. I've been wanting to find an excuse to use the 1990 Fleer baseball design for some time now. For baseball Fleer's designs are not as classic as really any of their Topps counterparts, but this particular year was probably my favorite. The design is clean and attractive. I've done other cards tied to the year 1990, but I didn't feel any of them would be right for this design. Before Michael Jordan quit basketball to try his hand at baseball he took some BP at the old Comiskey Park and hit a couple into left field stands. This was July of 1990, the same year the Detroit Pistons bounced the Bulls in the Eastern Conference Finals for the second year in a row and went on to capture their second of back-to-back NBA crowns. But, I digress. 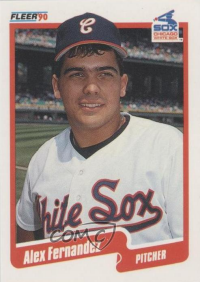 It's was sort of a thing to the point that Upper Deck included a short print card in their baseball set of their poster boy to commemorate the event. 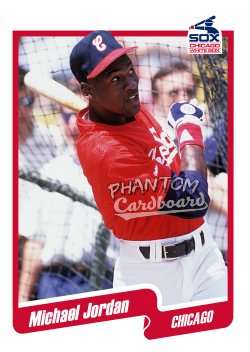 I never owned one but I do remember having one or two unlicensed "Broder" Jordan baseball cards. 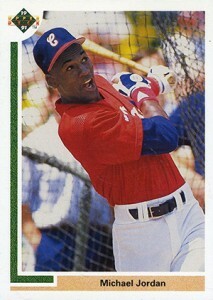 Outside of liking the overall aesthetic of 1990 Fleer set I really dig the White Sox uni that Jordan was wearing. I used to have the cursive "C" hat like the one he's wearing and would actually like to get another. That's not to take anything away from their blacks-and-white unis they've been donning after these, they're classic too. If ever there was a card I made that turned out exactly like my vision of it would, it's this one. It's a perfect manifestation of what I wanted to produce. In the spot where the player position would go I simply put "Chicago". I thought that just about covered the spirit of the card. I toyed with "Guard", "G-OF" and "1990", but ultimate chose the city name as it applied to both the Bulls and White Sox. This is yet another card I have no hopes of getting signed. Not only would the odds be against it should I send it in the mail, but I think Michael Jordan is contractually obligated only to sign Upper Deck Authenticated cards. Ironically Upper Deck purchased all of Fleer's trademarks during Fleer's 2005 bankruptcy. So, maybe UD will make a retro card similar to this one day?